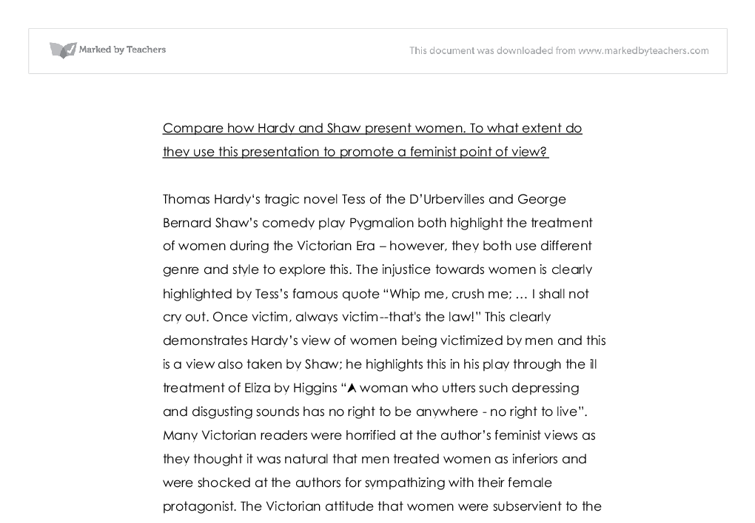 Compare how Hardy and Shaw present women. To what extent do they use this presentation to promote a feminist point of view? Compare how Hardy and Shaw present women. To what extent do they use this presentation to promote a feminist point of view? Thomas Hardy's tragic novel Tess of the D'Urbervilles and George Bernard Shaw's comedy play Pygmalion both highlight the treatment of women during the Victorian Era - however, they both use different genre and style to explore this. The injustice towards women is clearly highlighted by Tess's famous quote "Whip me, crush me; ... I shall not cry out. Once victim, always victim--that's the law!" This clearly demonstrates Hardy's view of women being victimized by men and this is a view also taken by Shaw; he highlights this in his play through the ill treatment of Eliza by Higgins "A woman who utters such depressing and disgusting sounds has no right to be anywhere - no right to live". Many Victorian readers were horrified at the author's feminist views as they thought it was natural that men treated women as inferiors and were shocked at the authors for sympathizing with their female protagonist. The Victorian attitude that women were subservient to the man comes from the biblical view that Eve was made from a part of Adam. ...read more. Hardy points out this desperation to highlight the fact it was not just men who "sold" their daughters; there were also women who had to use their daughter's beauty as a weapon for money and attraction towards men "Her mother's pride in the girl's appearance led her to step back like a painter from his easel, and survey her work as a whole". Even though Joan does this with affection there are deeper motives involved Hardy clearly use this to show that this novel is a tragedy and this selling will have terrible consequences in Tess's life. Shaw and Hardy also clearly portray women as the "puppets" or "dolls" who are easily used by men and are not allowed to be in control of their own actions and destiny. Higgins views Eliza as an experiment, "Yes, by George: it's the most absorbing experiment I ever tackled." Shaw states that Eliza is nothing more than a live doll without a mind of her own "you certainly are a pretty pair of babies playing with your live doll." She is still a lifeless statue with an element of crudeness in her parrot-like conversation "She's to keep to two subjects: ...- and not let herself go on things in general". ...read more. She takes the law into her own hands and punishes the offender, as she took Christianity into her own hands to get her dying baby into heaven. But Tess' hands are a woman's hands and within the era they would have been seen as incapable to administer sacraments and they are not supposed to administer justice - so her death is inevitable. Similarly Eliza, who would never have been a "lady" if she was a "flower girl" to start off with, she clearly highlight to Higgins that "... the difference between a lady and a flower girl is not how she behaves, but how she's treated" telling him that his treatment it's the reason why she is leaving him. The independence of both women helps them decide their own future and so in the end they both accept the problems or consequences they will face as Eliza states "I sold flowers. I didn't sell myself. Now you've made a lady of me I'm not fit to sell anything else." 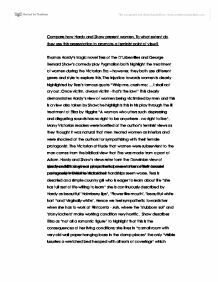 Although both female protagonists do not particularly have a ending they desire nevertheless they both have been in control of their own actions and have created their own destiny, enabling, Hardy and Shaw to end their work on a more feminist assertive note. ...read more. Dairy, but the bubble of idealism in which the lovers are living. While Angel may be raised to "godlike" status while Tess is referred to as "the Magdalen", supporting Tess' idolatry of him, they cannot escape the third presence in their relationship. In this way, nature and its parts act as a mimic for the story. When Alec D'Urberville first meets Tess, he immediately begins to seduce her. He feeds her strawberries - one of nature's most seductive fruits, due to its rich red colour - and is riveted by the form that nature has given her. His attitudes towards the country folk are shown perfectly when, in Chapter Ten, he addresses the group of country workers as "work-folk", showing he considers them useful only for manual labour and of lower intelligence than himself. He defines them by what they do, rather than what they are. This gives the audience a great understanding and knowledge of each character; therefore they're able to predict what will occur after each turning point to each character. Henchard realises he is in yet another disaster. Michael had not too long before his wife and daughter had found him, spent the night with a woman called Lucetta. her noble and inexperienced personality to do so.In this way Hardy indicates out the correlation between power and desire in a relationship. Once Tess begins to work at the D'Urberville estate she effectively comes under Alec's authority. Henchard too is occasionally very cynical; this quality seems to effect many of his actions. He does not seem to ponder over anything. This is an unfortunate characteristic, which I think is one of the main reasons for his collapse.